Winner of the Reader Views Literary Award, Societal Issues and theReviewers Choice Best Non-fiction Book of the Year, Specialty Awards, Schooled on Fat explores how body image, social status, fat stigma and teasing, food consumption behaviors, and exercise practices intersect in the daily lives of adolescent girls and boys. 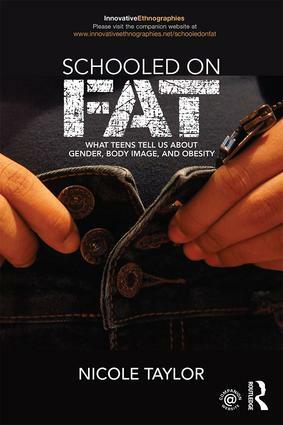 Based on nine months of fieldwork at a high school located near Tucson, Arizona, the book draws on social, linguistic, and theoretical contexts to illustrate how teens navigate the fraught realities of body image within a high school culture that reinforced widespread beliefs about body size as a matter of personal responsibility while offering limited opportunity to exercise and an abundance of fattening junk foods. Taylor also traces policy efforts to illustrate where we are as a nation in addressing childhood obesity and offers practical strategies schools and parents can use to promote teen wellness. This book is ideal for courses on the body, fat studies, gender studies, language and culture, school culture and policy, public ethnography, deviance, and youth culture. "Wow. Reading this book was such an intense experience. […] The straightforward reporting, and dialogue with the study participants, really brought up some difficult emotions while I was reading. On one hand, I felt that I was comprehending the information through the eyes of a parent […] On the other hand, the candid discussions brought back memories of a time long ago […] Suddenly I was reliving my own experiences in high school and reflecting on how those experiences shaped a lifetime of dieting, exercise, and social issues for me personally. The writing is brilliant, it’s obvious much time, and effort was spent on the study. Well-written and thoroughly researched, Schooled on Fat by Nicole Taylor should be required reading for every high school teacher AND student. It contains a wealth of quality information crucial to the understanding and development of our children." "Deeply immersed in the dramatic and mundane of everyday high school life, Taylor's access, insight, and interpretive skill beautifully reveal our cultural preoccupation with the 'obesity epidemic' as it is played out in hallways, locker rooms, and cafeterias. Schooled on Fat adeptly disentangles how teenagers talk about their bodies, themselves and each other from overarching disciplinary discourses of morality, sexuality, health, and consumption. A must for the undergraduate classroom!" "Schooled on Fat is an innovative and critically important ethnography that will change the conversation about teens and body image. Taylor’s careful study reveals that teenagers are far more than simply passive recipients of cultural messages about 'thin' and 'fat,' but are active participants in their creation. As such, they are also potential allies for change. This book could have far-reaching implications for the mental and physical well-being of young people; a rare and commendable accomplishment." "This book offers an intimate portrait of the everyday lives of teen-aged girls and boys, exploring what it means to grow up in an increasingly obese society that idealizes slenderness and stigmatizes fat. Taylor provides vivid accounts of what goes on in the halls of a public high school and behind the closed doors of locker rooms, where ideas of acceptable and unacceptable body image are negotiated on a daily basis. This engaging ethnography brings a fresh and nuanced voice to the obesity debate and is a must read for educators, parents, policy makers, and young adults." "Along with frenzied national discussions on obesity, nearly each day individuals are bombarded with gendered images of an "ideal" body. How do these cultural constructions and national discourses influence teens and how they view their own bodies? These are the broad questions that form the backdrop to this book. The author examines how cultural beliefs about idealized body images are construed, contested, and consumed differently by boys and girls, and sheds light on the subjective nature of how "fat" is understood through everyday language practices of the high school culture. The stories provided are intimate, lived realities of 50 teens, who reveal the sometimes contradictory nature of certain practices (the abundance of junk food choices and limited opportunities for exercising) that do not promote healthy body weights. Despite the title, the book is about more than just obesity and body image; more generally, it offers insight into gendered identity constructions. Written in clear and jargon-free language, the book is accessible to anyone interested in teenage body image issues and gender." 1. "You Can’t Have Your Fat Showing" 2. "Guys, She’s Humongous!" 3. "When I Run My Legs Jiggle" 4. "It’s All Going to Turn into Fat" 5. So What? What Now?